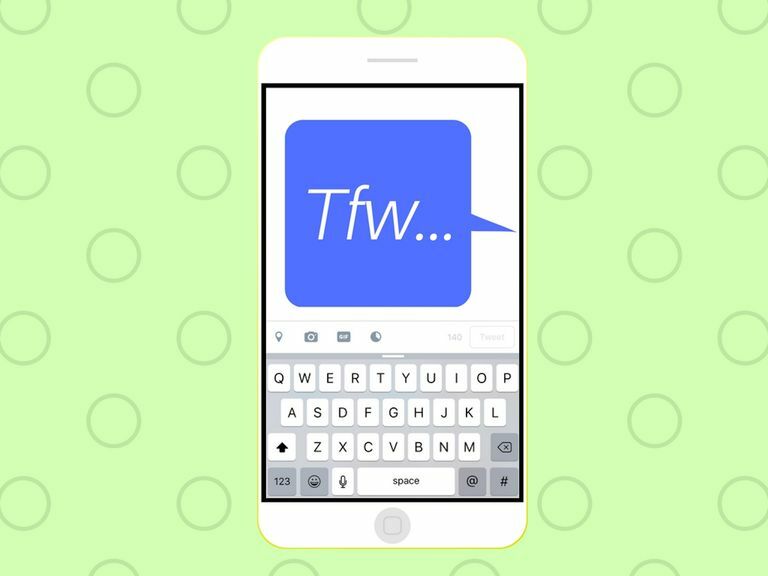 What Does TFW Mean and Stand For? So maybe you just spotted a social media post, a comment or a text that starts with TFW and is followed by a sentence. But what does that even mean? Yes, it's a popular saying on social media. No, it's definitely not grammatically correct. People typically use TFW to convey some kind of emotion or feeling in any given context that's relatable enough for other people online to know exactly what you mean — yet while still remaining open-ended enough that they can come up with their own interpretation of it. The grammatically correct way to say TFW would be along the lines of, "I love the feeling you get when..." In the acronym, the "feel" is a shortened, slang word for "feeling." "TFW you're lying in bed at 4am still wide awake." "TFW you finally get a text back after seven and a half hours." "TFW you realize you almost just poured coffee in your cereal instead of milk." The three examples above should give you a good idea of how the trend works. In general, the acronym is used at the very beginning of a sentence, followed by some kind of mundane, everyday activity that most people have done before. "TFW when you go skydiving but forget to take out your retainer first." Relatable? Not really. Hilarious? Absolutely. Building on the humorous/exaggerated effect of TFW, online users will sometimes put TFW at the beginning of a completely ridiculous situation that's extremely specific and not at all relatable (but at least somewhat imaginable thanks to the detailed description) in order to exaggerate the expression. The acronym is popular on Twitter since it works perfectly for describing odd, hilarious, and awkward situations using text speak, bad grammar, and short forms of other words. As with most memes and acronyms that seemingly tend to come out of nowhere, TFW is primarily embraced by younger social media users who have no problem with never spelling anything correctly or using improper grammar. Even though the internet is becoming increasingly visual these days with the number of social media platforms that are driven by image and video sharing, plus the rise of emoji, the TFW trend offers just a little extra communicable emotion that can sort of be left up to the reader's imagination. It's unclear exactly where the acronym originated from, but it could very likely be tied to the I Know That Feel Bro meme, which features a simply drawn character hugging another character as if he were empathizing with him. It popped up on the Internet sometime in 2010. Memes have come a long way in helping people communicate their feelings and emotions online. From Feels Good and Feels Good, Man, to simply just Feels and Feels Bad Man, it's clear that using meme variations have become a very acceptable way to emotionally express what words can't. While TFW is generally meant to be accompanied by a descriptive sentence of some sort of relatable situation, it can be paired with a photo or even a GIF to further visually express the emotion behind the message. Sometimes, nothing conveys it better than an image. And that's all you need to know about the TFW trend. Now you can go ahead and get on Twitter, Facebook, Tumblr or whichever social network you want to join in on all the relatable TFW fun, and see how many likes/retweets/reblogs you'll get from all your friends who get it. What Does DW Stand For in Chats? What Does 'DH' Stand For on the Internet? What in the World Does LMA Mean? What Does the Acronym SOML Mean? What Does Going Viral Online Really Mean? What Exactly Does ISTG Stand For? What Does the Phrase 'DS' Stand For? What in the World Does OOMF Mean?